Master Deenanath Mangeshkar Hospital Foundation Stone Laid By Lata Mangeshkar. Little Lata, came home after watching K.L.Saigal's 'Chandidas' directed by Nitin Bose and declared that she would marry Saigal Saab when she grew up. Here begins, Hindi filmdom's most enduring love story. Between Lata Mangeshkar and Hindi film music. A story of passion , commitment and sincerity . A story that has taken on the awesome dimensions of legend .A story that has charmed and enchanted millions all over the for more than five decades . Probably no other single person is recognized as the largest contributor to film music . no one else is synonymous with power and magic of Hindi film music , whose mesmeric reign continues to amaze critics and devotees alike. When seven year old Lata played Narad, to her father's Arjun, despite his protests that he was so much older, already she was showing sings of maturity and sobriety that would remain her trademark characteristics, when she had "Don't worry Baba, I'll manage. I am , not your daughter for nothing". On that momentous evening in Sholapur, little Lata brought the house down with her acting and singing . Glimpses of brilliance that would light up celluloid like a meteor. Despite detesting acting, Lata played several cameo parts in Hindi and marathi films including Pahili Mangalagaur (1942), Maze Baal (1943) , Badi Maa (1945 ), Subhadra (1946 ) Chimukla Sansar (1943) , Gajabhau (1944 ) ,Jeevan Yatra (1946 ), Mand (1948 ), Chhatrapati Shivaji (1952 ). Domestic responsibilities compelled Lata to act, after her father's untimely death. In her first film Pahili Mangalagaur, she played actress Sneprabha Pradhan's sister. In Badi Maa, starring Noor Jehan, Lata acted, sang for herself and for younger sister Asha. Financial hardships, her own artistic struggles notwithstanding, Lata has never lost sight of the priceless value of humility and hard work. As her father and guru has impressed on her "Never be carried away by your success". This lesson has stayed with Lata throughout her life .. She wholeheartedly throws herself into every song, opening up the inner meaning of the lyric, building a bridge to that musical godhead. And yet this phenomenal talent, this divine benediction has never clouded her balance, mature temperament . Arrogance is said to be the ruin of genius. But not this genius , as Waheeda Rehman so rightly points out - 'Lataji never thinks of her self as THE Lata Mangeshkar. She has always done her job to the best of her abilities and then never looked back'. Here than her lifetime's span of music from one who has shaped ,defined and stamped with her indelible identity the from course of hindi film music. Thirteen year old, Lata recorded her film song for Vasant Joglekar's Kirti Hasaal. Pt Dinanath was not too pleased with her daughter 's decision to sing for hindi films. Later Joglekar said 'she has tremendous self- confidence. She is also an introvert. That is why she is not proud. But she reveals her pride in her singing'. And perhaps it is this pride that prompted Majrooh Saab to say 'It isn't as though she always got great lines to sing. She was given the same standard of lyrics as others. It is the magic of her voice that elevates the songs that she sang'. 'Magic in her voice', 'pride in her singing' has elicited comment and admiration from her numerous friends, admirers and colleagues. It was during her struggling days that Lataji met Kishore Kumar, Kishore da recollects the amusing circumstances in which he met the pint-sized phenomenon. Lata was on her way to meet Khemchand Prakash for whom she sang 'Aayega Aanewala'. When the conservative Lata saw a strange man going to the same place as her, she presumed the worst. Little knowing that their destinies would be intertwined and remembered in the many duets they sang together. 1949,was the breakthrough year for Lataji. Four years earlier veteran composer Mst. Ghulam Haider from Sind had accompanied the young Lata, to meet a leading producer in the hope that she would be given a song in the forthcoming film starring Kamini Kaushal. The tone-deaf producer rejected the eager nervous aspirant's voice as too thin and soft. The outraged Haider , who had earlier discovered Noor Jehan, prophesied 'Let me foretell today that this girl will soon put to shade everyone else including Noor Jehan. Producers and singers will fall at her feet begging to sing in their films'. And so it was to be. In the year 1949, a phenomenon erupted and one after another hits followed "Uthaye Ja Unke Sitam", "Aayega Aanewala", "Dheere Se Aaja Ri", "Chale Jana Nahin" and "Jiya Beqarar Hai." Songs that set the path for Lata's sublime musical odyssey Noor Jehan whose singing style influenced Lataji's erly numbers has no hesitation in saluting the art of Lata Mangeshkar. Noor Jehan states 'People say Lataji considers me a phenomenon . I say that's her humility. Lata is Lata. No singer , like her has ever been born'. Generous words and an unflinchingly honest evaluation of music phenomenon who swept all competition out of sight. As long as there's Lata I'm safe the exacting perfectionist Sachin Dev Burman is said to have exclaimed , when he heard that musicians intended to strike, threatening to paralyze all record activity. Sachin da was not the only composer of his generation to have felt safe in Lataji's hands. Naushad, C.Ramchandra & Madan Mohan, gave their unconditional best to create musical miracles to match the perfection of Lata. Generations of composers, heroines and film makers have looked upto Lata as their source of inspiration. Raj Kapoor regarded Lataji as a re-incarnation of Goddess Saraswati. He made an entire film 'Satyam Shivam Sundaram' on her incredible vocal skills. Films have sold on the strength of her vocals and gone on to become history. Lata has reigned through Father and Son composing teams. A rare honour for a rare artiste. Sardar Malik and Anu Malik, Roshan & Rajesh Roshan, S.D.Burman & R.D.Burman, Chiragupt & Anand Milind. Co-artistes have been kept on their feet by the small wonder. Duets with Lata were always a healthy competition between colleagues. Rafi, Mukesh, Kishore, Manna da would be amazed by the sudden last minute improvisations in the final take. Improvisations that took the song beyond the stipulations of the compositions into the realm of eternity. This unpredictability, this heightened anticipation gave that added edge to scores of duets sung with other legends. Much of this friendly rivalry was indulged in by Lataji with another formidable artiste Mohd. Rafi . Workaholic, perfectionist, master technician, brilliantly versatile Rafi matched her 'Gayaki' note to note. And yet, sometimes she took even his breath away. Perhaps it is this unpredictability that enhances Lata's genius as she continues to pit her talents against younger co-artistes, always managing to either steal the entire show or making that little extra impact. Her versatility is linked to her intrinsic sensitivity as this anecdote proves. Bimal Roy once persuaded Salil da to sing a complex Bengali song. Salil da obliged and was alarmed to find that young Lata had fainted. She confesses, 'While listening to the song, I was overcome. I couldn't control myself.' Moving sentiment is the hallmark of any Lata song. It is her ability to reach inside the lyric, to probe the nuances of moods, so skillfully balance changing cadences that make her so much in demand. She brings adaptability across generations and even within the life-span of an artiste. Remember the wide-eyed child woman appeal of Dimple in Bobby in 'HumTum Ek Kamre' ad you think of Lata. Remember the evolved mature, sensitive Dimple of Lekin on 'Yaara Seeli-Seeli' and you think of Lata. Trends have changed, technology has come to play a crucial role yet over the past decade the mega-hits have remained with Lataji. So who can accuse young directors like Jaitn-Lalit , Anand-Milind, Vishal Bhardwaj, Uttam Singh & A.R.Rehman when they flock to her and clamour for her participation in their personal success. As Lataji's voice has matured and mellowed, her style has remained distinct. Lata clones proliferate but when the original grows richer who wants imitations? For somebody who started by imitating Noor Jehan's style, Lataji has brought film playback a long way and played a definitive role in delineating the epitome of feminine expression. Lataji's own spontaneity perhaps plays a role in her constant improvisation. Lataji's easy sense of humour among friends is a little known secret. As is her famed banter and jokes in the recording room. Perhaps Lataji retains the child in her. Hidden behind her glasses, her austere white sarees, her long disciplined tresses, is a giggly girl who reveals in warm family moments, games & playful interludes with young nephews & nieces. True creativity can never be condemned it often spills over into other arts. Lataji is a much respected non-film performer. By her own admission, she finds her non-film compositions more challenging than her film songs. No Lata can forget , the album of her Meera Bhajans composed by Hridaynath Mangeshkar, 'ghazaldom' best selling album composed by Jagjit Singh & 'Aye Mere Watan Ke Logon' the song that brought tears to the eyes of Panditji. Lataji declares that her patriotic songs are so deeply moving , because she truly loves her country and through her voice is willing to do anything for her motherland. True Talent never goes unrecognized and that has been true of Lataji. Recipient of 4 filmfare awards, the Padma bhushan & Padma Vibhushan in 1989 & 1999 respectively, a mention in the Guinness Book Of World Records and the only Asian to have received the Platinum Disc of EMI London, Lataji personifies the true artiste. Relentless in her quest for perfection, effacingly humble, publicity shy, simple and doggedly diligent. At a public function she said 'I believe in past deeds and reincarnation. The fact that all of you have come here and showered me with your best wishes and given the feeling of fulfillment, what else can it be but the fruits of my past birth? Disregarding differences of caste, region, religion people have always welcomed me with great love. They have showered boundless affection on me for the past so many years. Can I forget this?' And so I salute the real 'Legend'. The inspiration of film music. A beacon of hope, courage and endurance. A shining light of perseverance . Yash Chopra rightfully says 'Usually it is an artist who follows the art. But in Lataji's case, it's the art that followed her'. 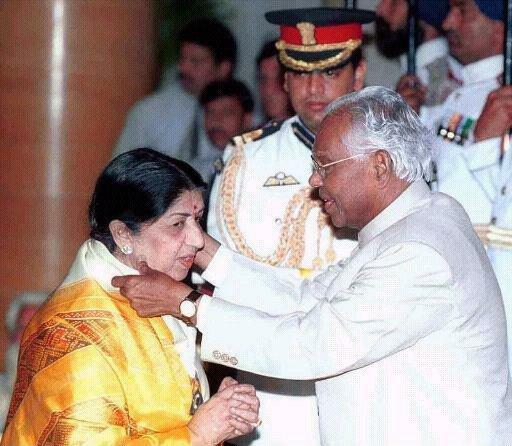 Melody queen Lata Mangeshkar, who has enthralled people for over five decades with her songs, was awarded Bharat Ratna on 25th January 2001, the nation's highest civilian honour. Lata,who has sung over 30,000 songs is already (rpt already) a recepient of Padma Bhushan, Padma Vibhushan and Dada Saheb Phalke award among other awards for her contribution to film and music. Her first song in 'Aap ki seva me' went almost unnoticed in 1947 but within two years she was on everyone's lip with her soulful numbers in "Andaaz', Barsaat' and 'Mahal'. Reacting to her selection for the Bharat Ratna, Lata said in London it was a "big honour" for her and added she would continue to do whatever possible to keep India's flag flying. She said, "I am very happy and grateful to the nation and its people who have showered me with such love and affection." "It is such a big honour,"said Lata, adding "compared to so many big artistes, I am a small artiste". Lata, who has already been given the Padma Bhushan and the Padma Vibhushan awards, said "Ultimately, for us the country means everything and for keeping its name and fame high, I will do anything." The shehnai maestro Ustad Bismillah Khan who was also awarded the Bharat Ratna along with Lataji said that He was more happy that Lata Mangeshkar had also been bestowed with the honour. If India had a voice, Lata Mangeshkar would be its articulation. The playback singer who made her debut in 1947 with Joglekar's Aap Ki Sewa Mein, continues to sing even today and dominates the billboards with her chartbusters in films like Maachis, Dilwale Dulhaniya Le Jayenge and Dil Se. In a career spanning six decades, with an oeuvre of over 25,000 songs, Mangeshkar has sung for almost all the heroines who walked across the silver screen. From Madhubala, Meena Kumari, Waheeda Rehman, Nutan to Madhuri Dixit, Urmila, Kajol and Preity Zinta, the diva has fired romance, pain, hope and nationalism with her soulful renditions. Until the late 1980s, she recorded about two songs a day, featuring in almost every Hindi and most other language films. It was only in the early 1990s that she chose to go slow and become increasingly selective, singing only for filmmakers like Gulzar, Yash Chopra and a few others. More importantly, Lata has managed to create an image of a revered didi (elder sister) in the national mindset, due to her selection of songs and her consistent tirade against the loss of poetry and decency in contemporary Hindi film music. Her rendition of Aye Mere Watan ke Logon sends the nation into a patriotic tizzy, even today. Such are the perennial splendours of her songs. The nightingale of India, Lata Mangeshkar, who has charmed her fans with over 50,000 songs she has sung as a playback singer in films, has no regrets that she never got married. Over the last 56 years of her singing career, Lata thought of retiring several times, but it was the affection of her fans that never let her call it a day. Lata, whose voice quality retains the freshness and innocence of a 16-year-old girl, says that in a way it has been good that she did not get married. “Had I got married, I may have got divorced in a year or two. It has all been all for the good,” she says. Lata wants to now give more attention to singing classical-based songs. She is not very happy with the kind of lyrics that are being written these days and recalls the days of yore when there was emotion in the songs. Everybody very careful that obscenity should not get into the songs even by inference. It was after India’s losses in the India-China war in 1962 that a young Lata had sung the song, “Ai Mere Watan Ke Logon, Zara Aankh Me Bhar Lo Pani”. The song, writeen by Kavi Pradeep, moved the then Indian Prime Minister, Jawaharlal Nahru, to tears and he confessed “Beti toone mujhe rula diya.” Lata’s reign over the world of playback singing for female characters has been undisputed over the decades and she has lent her voice to heroines from Madhubala to Madhuri Dixit to Kajol. She has surprised even her fans with the range of her singing in the film “Dil to Paagal Hai” whose title song has the same wording. Her song “Tere Bin Nahin Jeena” in the latest venture “Kachhe Dhage” is the last film in which the late Nusrat Fateh Ali Khan has given the music. It is said that Nusrat insisted that he would score the music for the film only if Lata was the playback singer. Yes, several female playback singers who could not, perhaps, match Lata’s range and talent, have alleged that during her long career at the top, Lata did not let other talented singers come up. It is not known how much truth there is in such allegations, but it is beyond dispute that Lata is a legend in her lifetime and undeniably the best singer India has produced. Her contribution to making music popular throughout India and the world is incalculable and she has reigned supreme all through the last six decades. Lata further revealed that by singing less these days, she was actually taking a much-needed rest. “I have been singing for the last 50 years, you know, so I deserve a break. Besides, there are talented singers around who can do justice to their work. I have decided that I won’t take up assignments that don’t interest me. I’d rather devote myself to non-film songs, which is why I’ve asked my brother, Hridaynath, to compose more such songs for me,” she disclosed. She said her style of singing was no longer suited to the type of songs that are being written and composed for films. Among today’s producers, she singled out Yash Chopra as the only filmmaker who understands which songs suit her voice the most. She added that for Dil To Pagal Hai he had asked her to sing Le gayee, le gayee at first, and changed his mind when he realised it did not suit her voice. In the same vein, she picked up Majrooh Sultanpuri from the lyricists, and commended him for striving hard to keep poetry alive in film songs, without succumbing to the temptation of writing trash in the name of lyrics. “I say so only to point out that there still are a few good people who can stem the rot from setting in deep,” she disclosed. Renowned singer Sudhir Phadke, the Dada Saheb Phalke winner Majrooh Sultanpuri, veteran actress Sulochana, social reformer Pandurang Shastri Athavale, social activist Nirmala Purandare and theatre personality Prabhakar Pansh-ikar are the winners of the Dinanath Smruti Pratisthan Awards for 1998 which will be given away at a function to be held at Dombivili, near Mumbai, on April 24. Thankyou for your e mail. Lata Mangeshkar (b.1929) has reportedly recorded 30,000 solo, duet, and chorus backed songs in 20 Indian languages since 1948. She has frequently had five recording sessions in a day and has backed in excess of 2,000 films. Melody Queen Lata Mangeshkar has been selected for the tenth 'Jeevan Gaurav Puraskar', instituted by the Chaturang Pratishthan, which will be conferred on her at the Kala Academy, Panaji (Goa), on December 29,2000 the day which concludes the birth centenary celebrations of Master Dinanath Mangeshkar. Lata has consented to personally accept this award which is in recognition of her immense contribution to the music scene during the past five decades. The award consists of Rs. 1 Lakh, a memento and a scroll of honour. Further [ As Vidyadhar Nimkar of Pratishthan told to The Times of India ] "This award is not only for her singing abilities but also for her contribution to social welfare activities.Lata Mangeshkar has done considerable work for different causes for which people are indebted to her. But at the same time, she has maintained a low profile. The award been conferred on her especially for this reason." The lady with the Golden Voice has expressed happiness over being chosen for such a prestigious award. Ghazal singer Jagjit Singh perhaps spoke for millions when he said that only three things in the 20th century would be remembered: "Lata's birth, man's conquest of the moon and the breaking of the Berlin Wall." After Mahatma Gandhi, one can't think of anybody other than Lata Dinanath Mangeshkar who has been bestowed with so much affection, admiration and nationwide following. Nobody put it better than noted 'Thumri' exponent, the late Bade Ghulam Ali Khan: "Kambakht to kabhi besurihi nahi hoti" (She is never out of tune). Indeed, it is difficult to explain a miracle like Lata. In her case, listening is believing. All the same, she swears that her singing is nowhere near perfection. "Let me confide in you the truth," she once told me, "When I heard Mehdi Hassan for the first time in London, I was moved to tears. 'This is singing,' I said to myself." But even doyens of the music world would do anything to hear her sing. Ghazal queen Begham Akhtar once rang up composer Madan Mohan late at night and pleaded with him to play over telephone his Lata composition, Chain nahi aaye. Sajjad Hussain, the temperamental genius, had this to say about the nightingale: "Lata gaati hai, bakhi sab roti hai" (Lata sings, all others cry). Other gifted composers shared that opinion and reserved their best compositions for the best female voice in the business, be it Naushad, Ravindra Jain, Roshan, Shiv Hari, C. Ramachandra or Laxman. Most of Lata's illustrious contemporariesÑcomposers, singers and lyricistsÑare no more. Those who are still around have ceased to be active. But Lata goes on. She sang like an angel for S.D. Burman, Roshan and Sardar Malik. She also sang for R.D. Burman and still sings like an angel for Rajesh Roshan and Anu Malik. Forty-six years after she sang that evergreen number Larelappa, larelappa, composed by Vinod in the film Ek Thi Ladki, Lata came up with Didi tera dewar deewana in Hum Aapke Hai Kaun. Different lines, different compositions, different yardsticks but only Lata Mangeshkar and her melodious, magnetic appeal remain the same. When shops are flooded with remixes and version songs, Lata said tongue in cheek at a Mumbai concert, "I hope you liked the songs I sang in Lata Mangeshkar's voice." Remind her that she is 71, and she will say, "You simply change the order of the numbers and I am 17!" India's Nightingale Lata Mangeshkar laid the foundation stone of Master Deenanath Mangeshkar Hospital and Research center in Pune, in a recent function where India's senior political leader and president of Nationalist Congress Party Sharad Pawar was the chief guest. The hospital project will be ten storied building with each floor of 27000 sq. ft. There will be 65 beds under different intensive care units, 12 operation theatres and facilities like Kidney transplant, CAT scan and blood bank. Hospital will have sections like neurology, nefrology, surgical oncology, cardiac surgery, neuro-surgery, medical oncology, urology and pediatric surgery. The hospital will also offer Ayurved ( India's traditional medical therophy ) and Homeopathic treatment to the patients. Doctors of Jnana Probodhini Medical Trust who are running 160 bed Sanjeevan Hospital in Pune city and also managing hospital set up by Dabhol Power Company in Ratnagiri district of Maharashtra and Kamala Mehta Eye Hospital in Satara district which is world bank assisted project. The project has been designed by well known architects M/s V. V. Badwe and Co. and the construction will be done by M/s Shapoonji Pallonji. Construction of the project is in full swing it has completed basement structure. The first phase of the hospital will cost RS. 220 million (about $ five million) and will be completed by August 2001. The high tech Medical center promises state of the art medical service at an affordable cost, while serving as a platform for internationally known Indian medical experts to offer their expertise to the Indian Society. The project has been designed by well known architects M/s Shapoorji Pallonji. Lata Mangeshkar, Asha Bhosle, Hridaynath Mangeshkar, and all other family members expressed their gratitudes towards the people of India and abroad who showered love and affection on their family.